For the name, see Ihsan (name). Not to be confused with Ihsahn. Ihsan (Arabic: إحسان‎‎), also spelled ehsan, is an Arabic term meaning "perfection" or "excellence" (Ara. husn). It is a matter of taking one's inner faith (iman) and showing it in both deed and action, a sense of social responsibility borne from religious convictions. In Islam, ihsan is the Muslim responsibility to obtain perfection, or excellence, in worship, such that Muslims try to worship God as if they see him, and although they cannot see him, they undoubtedly believe that he is constantly watching over them. That definition comes from the Hadith of Gabriel in which Muhammad states, "[Ihsan is] to worship God as though you see Him, and if you cannot see Him, then indeed He sees you". (Al-Bukhari and Al-Muslim). Ihsan, meaning "to do beautiful things", is one of the three dimensions of the Islamic religion (Ara. ad-din): islam, iman and ihsan. 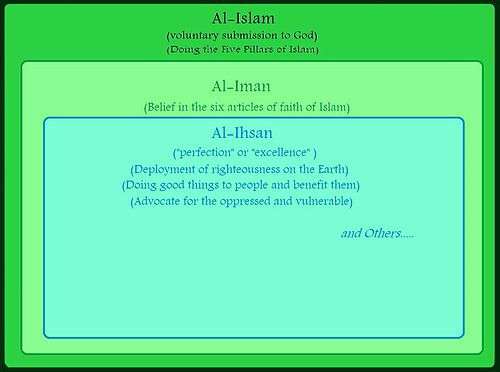 In contrast to the emphases of islam (what one should do) and iman (why one should do), the concept of ihsan is primarily associated with intention. One who "does what is beautiful" is called a muhsin. It is generally held that a person can only achieve true ihsan with the help and guidance of God, who governs all things. While traditionally Islamic jurists have concentrated on Islam and theologians on Iman, the Sufis have focused their attention on Ihsan. From the preceding discussion it should be clear that not every Muslim is a man or woman of faith (mu'min), but every person of faith is a muslim. Furthermore, a Muslim who believes in all the principles of Islam may not necessarily be a righteous person, a doer of good (muhsin), but a truly good and righteous person is both a muslim and a true person of faith. Ihsan "constitutes the highest form of worship" (ibadah). It is excellence in work and in social interactions. For example, ihsan includes sincerity during Muslim prayers and being grateful to parents, family, and God. ↑ Maqsood, Ruqaiyyah Waris (September 15, 1994). Teach Yourself Islam. Teach Yourself World Faiths. Teach Yourself. p. 41. ISBN 978-0-340-60901-9. Murata, Sachiko; William C. Chittick (2000). The Vision of Islam. I. B. Tauris. pp. 267–282. ISBN 1-86064-022-2.